One of the things you hear before moving to New Hampshire is that, in many cases, the locals are as passionate about peaceful solutions to the world’s problems as the liberty activists are. I found this hard to believe until I actually moved here, but recent events reminded me just how true it is. My father, Bill Davis, moved up here several months ago not as a part of the great freedom migration, but to be closer to his grand kids. You can imagine my surprise, then, when he came back from his new church excited about an opportunity to help local intravenous drug users via a strategy of harm reduction. I was even more surprised to learn that one of the people representing this organization was a former NHLA endorsed liberty representative to the State House! The organization that came to my Dad’s church is called the New Hampshire Harm Reduction Coalition, and their plan is a simple one: to hit the streets of some areas known to be afflicted with the opioid crisis to try and help drug users do less harm to themselves. They planned to hand out fliers to interested parties about what to do in the event of an overdose, offer clean needles and filters for their drugs (many users apparently use cigarette filters instead of something cleaner), educate users about the proper use of Naloxone (AKA Narcan), and most of all, show people that they are worthy of care and attention in spite of whatever choices they might be making in their lives. This is a cross-post from Freecoast.org, and was posted in an effort to raise awareness for the Fourth Annual Freecoast Festival. Hope to see you there! From 2010-2014 I ran a summer camp on the Northern shores of Oneida Lake in Upstate New York. We had 850 acres and a private 45 acre lake to ourselves for most of the year, and during the summers we welcomed in hundreds of children to help them understand what it meant to live in a community that put consent and voluntary interactions ahead of everything else. My living expenses were taken care of, and with the camp thriving, we could have stayed there forever had we chosen to. But, we left. In 2014 we moved to the Seacoast of New Hampshire, leaving behind security and mostly free living to join a growing community of liberty-minded folks that had left other destinations around the world to try and create something new. Why take such a risk when life was mostly going great? I’ll explain. The crackdown on Uber (check out the first installment in this story here) has escalated in Portsmouth, as the first Uber driver has been issued a $500 citation for peacefully attempting to drive people home after a night of drinking. The target of police aggression in this case was Stephanie Franz, a 63 year old grandmother and bus-driver who has been driving for Uber in her spare time. Do you hear that, city of Portsmouth? You haven’t even managed to scare Stephanie Franz. She and the other Uber drivers will continue to play your cat and mouse games, and liberty activists in New Hampshire will continue to shine light upon your protectionist scheming. Here’s a video from the leader of freeuber.org – activist Christopher David – who catches a little bit of the stop, and provides some context as to what’s been going on in Portsmouth recently. After watching the video, the question remains – why are the Portsmouth police sending multiple police cars to stop peaceful people from helping their neighbors get home from a night of drinking in exchange for a smaller fee than the local taxi cartel? According to David, the police officer recorded in his initial video called him to say that the bouncer who snitched on him for offering Uber rides is upset and “threatening to press charges” because Christopher allegedly didn’t get his permission to record their interaction. We’ll keep you updated as that situation progresses. If you want to support Christopher in his heroic efforts to nullify the Uber ban in Portsmouth (and perhaps lay a groundwork for nullifying these ridiculous bans worldwide), head over to FreeUber.org and get involved. 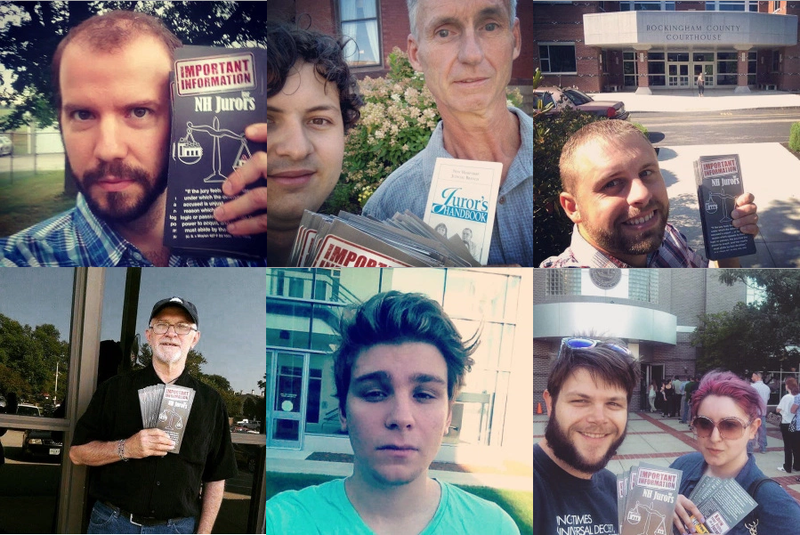 For additional coverage of the Free Uber movement in Portsmouth, check out Rights Brigade, a New Hampshire based activism group that has been assisting Christopher in canvassing the city with flyers to raise awareness for the city council’s protectionist schemes. On Saturday, October 10th, Free State Project early mover and Keenevention keynote speaker Christopher David was peacefully offering a very valuable service to the people of Portsmouth – late night rides home at a far faster and more affordable rate than the local taxi monopoly. He was picking up some eager customers outside of the Daniel Street Tavern when he was threatened with $500-$1,000 ransom for trying to help them return home. He recorded some incredible audio of the incident, which you can watch and listen to below. I took a cab once from here to Hampton, where I’m living, and it was $60. I take an Uber, it’s $28 – it’s a nicer car, and it’s nicer people. So, why would the city of Portsmouth possibly want to shut down a business that customers enjoy so thoroughly? Perhaps even more to the point, why would the bouncer at the Daniel Street Tavern (you can leave them a review here, as I have) be chasing down police offers to tell them of an Uber driver trying to get his customer home to safety? Taxi services on the Seacoast are notoriously slow to respond to customer inquiries, and are also known to shut down before bars have last call. Uber was filling this niche in the marketplace very nicely, until the Portsmouth city council decided to ban Uber this summer. This leads to a very dangerous situation for all drivers in the Portsmouth area, giving incentive for more drivers to be on the road while impaired. It’s one thing for a city council to attack the people of Portsmouth. That’s pretty much what city councils do. But bouncers at private institutions, who should theoretically have a vested interest in their customer’s safety? It’s downright irresponsible.